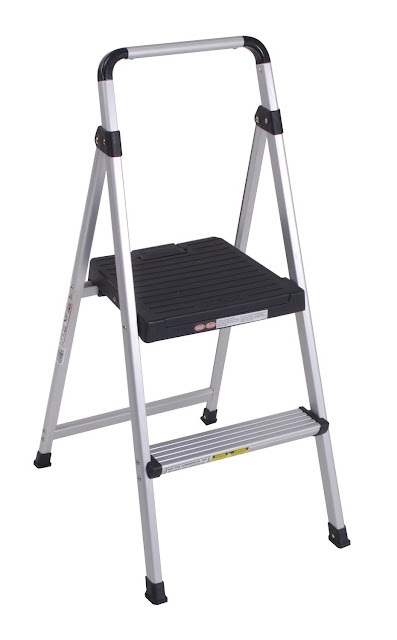 The Cosco Lite Folding Step Stool is a great addition to anyone's home, garage, or workspace. This stool is constructed with two metal steps that are sturdy with continuous rear leg support for added strength and also features non-marring, skid resistant front legs for ease of use. The steps of the stool also feature a ribbed texture to help prevent slip and fall accidents. This folding stool is easy to carry from one job to the next and is able to be folded and stored away without taking up a lot of space. If you are in the market for a great, indoor and outdoor use step stool, look no further than the one made by Cosco Lite. This stool may look small, but it is extremely useful when it comes to doing jobs in and around your home. It includes a number of safety features as well as a carrying handle that makes moving the ladder from one job to the next a breeze. Additionally, this stool folds up to a very slim profile, making it easy to store in a closet, under furniture or in a small space in the garage. When we began looking for a stool, we were hoping to find one that would work well for our painting projects as well as cleaning and maintenance projects around the home. Many of the products we found were either too tall or too short for our applications or they were bulky and hard to store. The stool was the perfect height for those regular around the house jobs and the safety features that are included make it safe for almost every one of our family members to use. Overall, the Cosco Lite Folding Step Stool is a great product to keep around the home. We are currently storing our stool out in the garage between the toolbox and the wall - this way it is safely stored and out of the way when we are working on other projects but also easily accessible when we need it. The slip-resistant steps and no-skid legs make use confident when using the stool and the easy folding and carrying of the Folding Step Stool make it simple for us to move from one area of the home to the next.